Place the zest, juice, mustard, garlic powder, and pepper in a large bowl. Whisk to blend, then drizzle in the oil while whisking vigorously. Add a little honey, whisk, and taste for tartness. Keep adding honey, a little at a time until you've taken the real bite out of the lemon. Reserve this dressing for later. 2. Rinse the Snapper, and coat with the oil, then the blacken. 3. Have the grill set to a medium high heat, squeeze some lemon juice on top, and cook the fish until it's just barely cooked on the first side, you can tell how well done it is by poking a spatula into the center of the meat. Carefully flip it over, squeeze some more lemon juice on top, and cook until it's just barely cooked through. Don't over cook, or the meat will become tough and dry. 4. While the fish is cooking on the first side, chop the lettuce, add it to the vinaigrette, stir to combine, and place it on a large platter. 5. 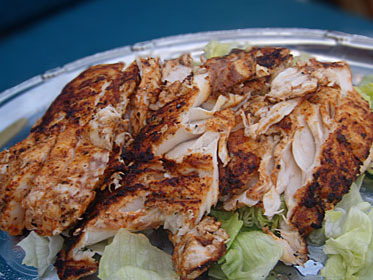 When the Snapper is cooked, place it on the bed of lettuce, while flipping it over. Squeeze a little more lemon juice on top, and serve.